TheScore.ie Machine would be relegated to Greg Dyke’s ‘Englishmen Only’ division if it wasn’t for the Uruguayan striker. 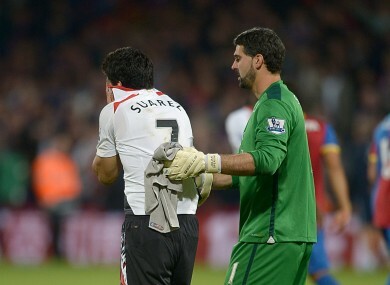 Luis Suarez and Crystal Palace goalkeeper Julian Speroni. THE GAP IS a meagre 331 points between TheScore.ie Machine and the new leader of the Joy Division league. Bookie Busters AFC have stormed up on the rails to lead our league by three points from Gillespie Road going into the final weekend. As title races go, it may prove more exciting than Manchester City’s procession to their second Premier League in three seasons. Edin Dzeko is another chap finishing the season like a thunderbolt’s brainwaves. The Bosnian has smuggled in four goals in two games and, at 7.5m fantasy monies, he represents a great punt for the weekend. It is hard to see beyond Luis Suarez pilfering the bejaypers out of ragged Newcastle United on Sunday. We punched our captaincy ticket L.S early in the season and will ride his goalscoring train until the last stop. While City may win the league in cagey, 2-0 style, this hound thinks Liverpool will finish second in a blaze of glory and rough up Toon in the process. There was a temptation to make reliably excellent Seamus Coleman captain for the final game but Everton are away to Hull. I could not afford to get Yaya Touré back in The Machine but if you have any spare dosh knocking around, splash out on the Ivorian. My final punt is on transfer purchase Christian Eriksen to team up with hate to love him Spurs teammate Emmanuel Adebayor for a goal and apiece assist. Sorry Rickie Lambert but your talented bulk is going on the bench. This is the ideal weekend to climb the standings as most folks have given up the ghost of winning. If you can not win your league, go all out to climb the standings and keep some pride in store for the cold, harsh off-season. Email “Diary of a Fantasy Gaffer: Dry your eyes Luis, we have a league to win”. Feedback on “Diary of a Fantasy Gaffer: Dry your eyes Luis, we have a league to win”.